Today, two decades have passed, but the shadow of the 1990s conflict still lingers. The war in Bosnia and Herzegovina was started as a series of mass atrocities against Bosnian Muslims, and it was fueled by the indecisiveness of the UN and NATO, and the bias of the European Union. In fact, to prevent themselves from being killed, Bosniaks repeatedly sought the lifting of the arms embargo. With the arms embargo in effect, the Bosniaks had no means of self-defense against the heavily armed and well-equipped Serbian and Croatian armies. The situation went out of hand in the year 1995, when the Srebrenica Massacre took place. It was a planned genocide, wherein over 8,000 Bosnians were killed, and over 40,000 people were expelled from a UN “safe zone”, that was supposed to be protected by Dutch peacekeepers. To make matters even worse, the Western powers, as per declassified US documents, were aware of the fact that Serbs were planning to attack Srebrenica. 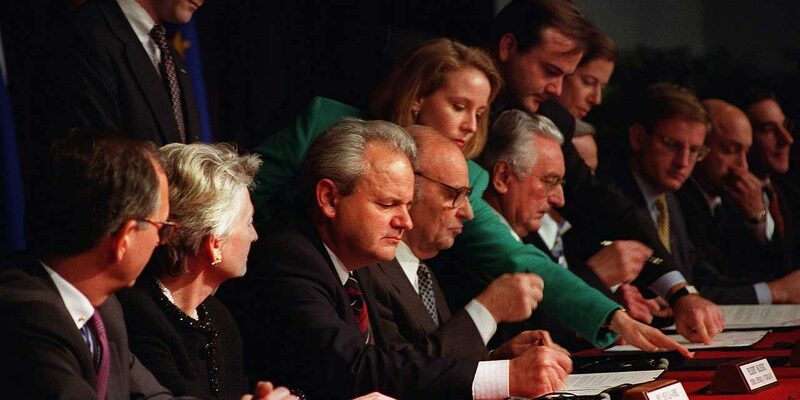 Each of the parties challenged the prospects for success in their own way: the Bosnians were disorganized, Milosevic dishonest, and Tudjman disengaged. However, an element of credit should be given to the Dayton Accords. Back then, the war would not have ended in the absence of the Accords. Plus, today, in spite of ethnic polarization, Bosnia and Herzegovina is still one united state. The future cannot be predicted, and while ethnic, regional and communal tensions still exist, prospects of peace are not fully weak either.